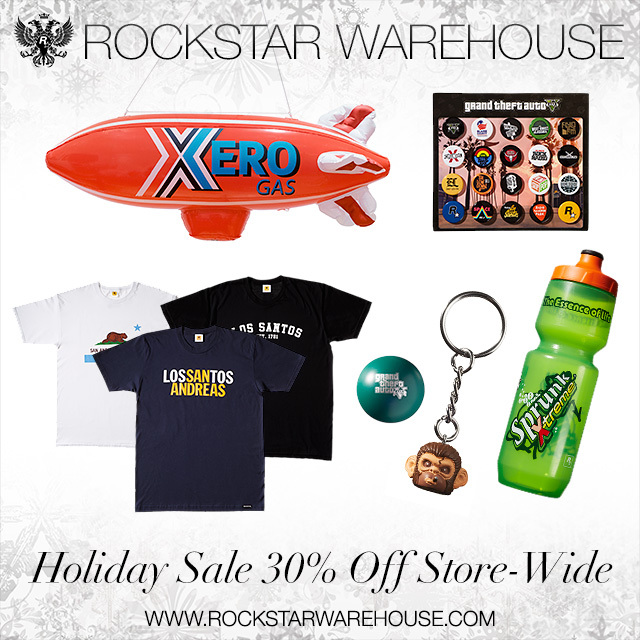 Now through December 22nd take advantage of the Rockstar Warehouse Holiday Sale and get 30% off everything that you see storewide. That includes all games in stock from the latest generation releases of Grand Theft Auto V on PS4, Xbox One, and PC, to classics like GTA San Andreas, Manhunt, Bully and more! Or get 30% off Original Soundtrack CDs, classic tees and collectibles like the Red Dead Redemption Eradicator Soap, L.A. Noire Torch Flashlight, digital downloads of full PC games and even Shark Card currency for GTAV PC to line that Maze Bank account. Rockstar has also added even more gear to the official Grand Theft Auto V collection that has never been available to purchase before now. So whether rounding out your own personal stash of GTAV collectibles or looking for cool stocking stuffers to gift a fellow GTA fan - you can now pick up sought-after items like the Grotti Polo Shirt, the GTAV Radio Station Pin Set, the Sprunk Water Bottle, the XERO Inflatable Blimp, the Dr. Friedlander Stress Ball, and more – all at 30% off through Tuesday, December 22nd! Also, keep an eye on the Warehouse as coveted items that sold out after the Thanksgiving Weekend Sale such as the Merryweather Heat Changing Mug and the Epsilon Program Paperweight have been restocked due to popular demand! Enjoy and join the fun at the GTA V forums!